ALL Work & Social is Spinningfields’ community for innovators and disruptors from the tech, media, digital and creative communities. Offering an independent, boutique workplace and service, with unrivalled connectivity to influential people and businesses across Spinningfields and the wider Manchester community the ALL Work & Social community is built to encourage growth. Precision designed with the highest quality environment for working and socialising in Manchester. 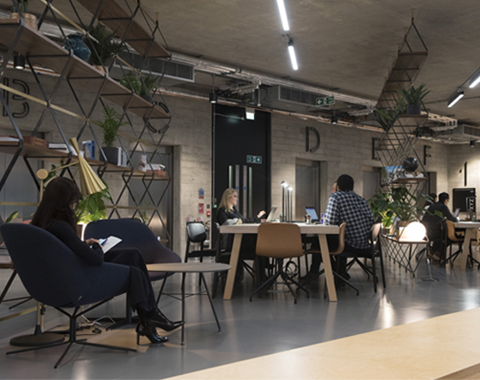 Members can experience elegant and minimal interfaces set alongside exposed concrete ceilings and full height windows to create a stimulating environment for growth. The lines between working and socialising have never been finer, and the spaces represent this through attentive design shaped by experience and research. ALL Work & Social is situated within the XYZ building on levels G, 1 and 7 alongside a unique blend of tech-enabled businesses from a spectrum of industries including Global Radio, Shoosmiths and NCC Group.